Since 2003, the Center for the Arts Evergreen has welcomed visitors from the mountain community and from around the world. Our location in the wooded park next to Buchanan Recreation Center makes us a convenient stop in the middle of a busy day. Visitors come to view our ever-changing exhibitions or to take in a concert or special noon "Brown Bag" lecture program. We are a pleasant refuge, a good place to read your favorite poetry, visit with friends, or just sit in an atmosphere filled with thought-provoking art and ideas. Our classrooms are always a beehive of activities, whether filled with adults or children, novice or expert, all seeking to learn new techniques or to hone existing skills under the guidance of our expert teaching core. Our class offerings offer a wide selection to choose from: fine art, writing, crafts, and more. We are here to serve our community and we thank all of them for the support they give us. There is no need to wait for an invitation to a special event (of which there are many at the Art Center). Just come by and visit. We would love to welcome you. Lyndsey Rosenberg, Melanie Warsinske and Beth Riser invite you to join them as they share their journey of inspiration and artistic process in clay and stone. A community arts festival featuring handmade original works from local and regional artists. CAE’s gallery space is transformed into a holiday gift shop with one-of a kind jewelry, design objects, ceramics, paintings, prints and more! Please join us for the opening reception to enjoy snacks and refreshments while browsing the goods and mingling with artists. This exhibit runs from November 20-December 30 2015. The Center for the Arts Evergreen proudly presents Roots in Clay—an exhibit comprised of the Mountain Area Potters Gang as well as other clay artists. The Mountain Area Potters Gang (MAPG) is a group of local artists who share a passion for pottery and art, using clay as their primary medium. Periodically throughout the year, members of MAPG are invited into one another’s homes and studios to socialize and enjoy delicious gourmet potluck meals, served in beautiful handmade pottery vessels. The artist hosting the gathering may propose a specific discussion or may organize an inspirational kind of “show and tell” event, encouraging each artist to share their individual expression and experiences through working with clay. Many in the Gang have been working with clay for over forty years and others are newer to the medium. Likewise, many members are locally and nationally well-known, and several teach in the area. The Mountain Area Potters Gang, which was started over fifteen years ago, provides its members with friendship, support, inspiration, and respect for all levels of expertise and experience. Center for the Arts Evergreen is very pleased to present the delightfully varied work of the Mountain Area Potters Gang, on display May 6-June 9 2016. Pat Fitzharris Newman, Monika von Glinski, Tanya Keith, Tom Edwards, Dorothy Connors, Marta Rodeheffer, Etta Satter, Meryl Sabeff, Kathleen Laurie, Matt Clagett, Susan Bogard, Mary Cay, Alice Pierson, Trudy Chiddix, Susan Bittell, Judy Nafziger, Gail Heilmann, Gail Frasier, Diana Begner, Lee Wolff, Timothy Young, Bob Smith, Gretchen Larson. An evening of ORIGINAL MUSIC featuring four songwriters from our mountain area: Michael Wisniewski, Tom McNeill, Kathleen Widlund, and Jeff Scarborough and a special appearance by Jesse from Evergreen High school. 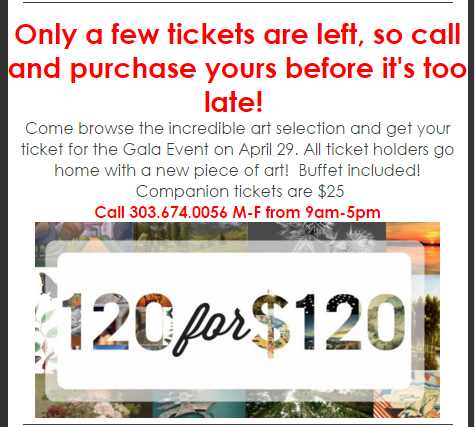 The Center for the Arts Evergreen (CAE) is pleased to invite you to our annual fundraiser, 120 for $120. In this unique exhibition and gala, 120 artworks are collected, exhibited, and then raffled to 120 ticket holders in a one-night gala event. CAE supports Evergreen and its surrounding communities in the visual and performing arts and uses the funds raised to continue these programs. We offer art classes and workshops, a variety of free exhibitions year-round, summer camps for kids, art in schools grants, and more. Donated artwork for 120 for $120 is any original fine art media: painting, drawing, prints, photography, sculpture and ceramics. Opening: April 15 4-7pm / Gala Event and Art Selection: April 29 5-8pm. Please call 303.674.0056 for tickets.